"Something I hold so dear"
It was a cool day in the desert on March 18, 2006, happy grey clouds scudded across the sky. The brisk wind rocked my truck, promising a sand-filled day as I ricocheted through the crazy Tucson streets toward the Military Recruiting Center at 2302 E. Speedway. In this town, many citizens seem to have replaced the gas and brake pedals of their vehicles with a simple toggle switch where up is full power, down is full brake. When I arrived at the Center at 8:00 am, at least ten patriotic citizens were already on the scene, placing bunting, flags, streamers, balloons and banners across the building and parking lot. The Support The Troops rally at the Military Recruiting Center strip mall was planned on this day for a reason. 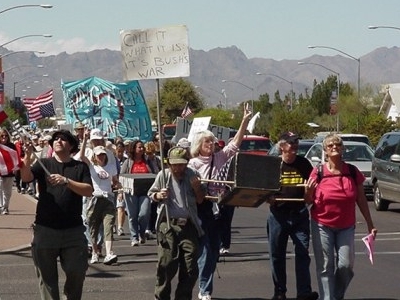 Every year on this anniversary of the start of the Iraq war, the "anti-war" crowd had held a rally at Catalina Park, busing in various groups to regale them with socialist propaganda and anti-American hate speeches. 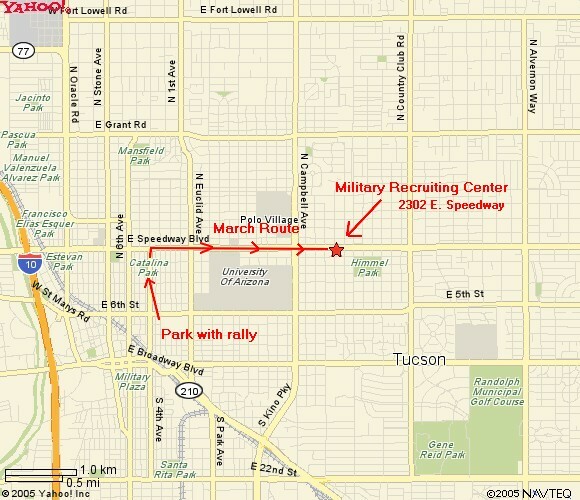 After that, it is customary to march through the University of Arizona, then down Speedway Boulevard ending at the Recruiting Center to mob and trash the strip mall while holding signs celebrating the number of troop casualties and accusing them of atrocities. Flag draped coffins are a must at these events. There is a weekly Wednesday morning protest at the same location that has been reduced to about ten protesters or less, however, about two hundred were expected this day. 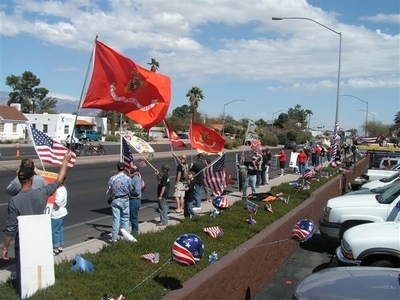 The Pro-American side hoped to fill the strip mall with people who supported America, the troops and their mission. There are many reasons not to go to an event like this. Often other things are planned, like fishing, camping or chores. Some feel the "moonbats" as we call them (they call us "fascists") are not worth the time, being too wacky to take seriously. Others are afraid violent peaceniks may riot. Sometimes people are just embarrassed to stand on a sidewalk holding a sign or flag. A few say they won't be able to hold themselves back upon seeing anti-military and anti-American propaganda. The ones who do show up are always dedicated patriots and knowledgeable people with positive attitudes. 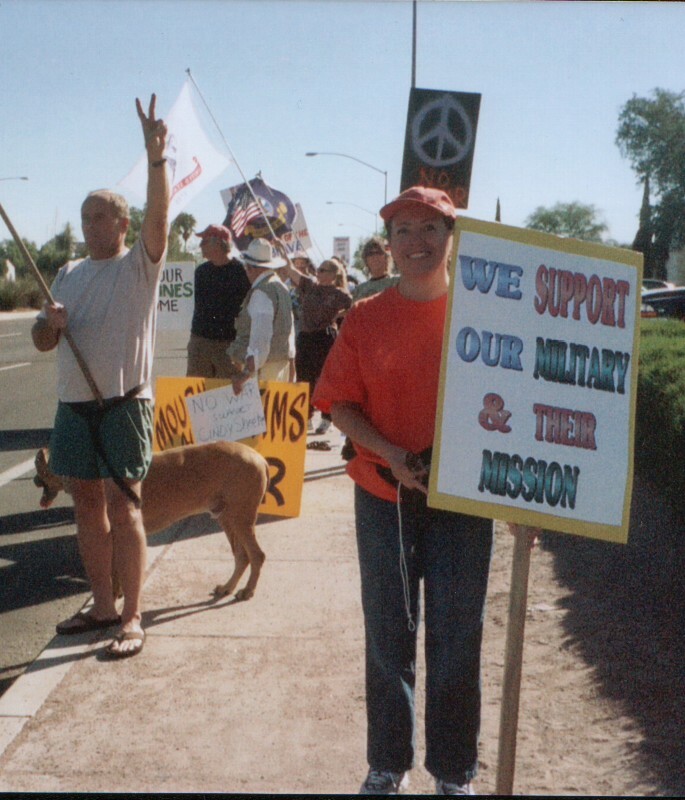 Protest Warrior leader Dennis and I had a secret mission this day entitled "Operation Signpost." Quickly traveling the march route, we placed one-page posters on light poles along the way, with simple messages like "God Bless America" and "America Loves The Troops and Their Mission." 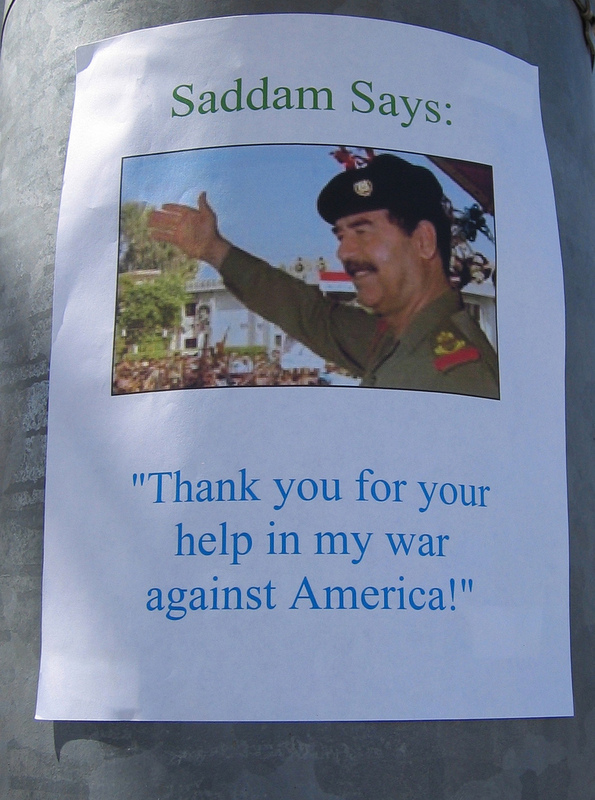 There were also a few humorous signs with a picture of Saddam Hussein saying things like: "You're doing a fine job and if I escape, I probably won't kill you." We quickly returned to help set up as a tall flagpole was being raised on a truck. 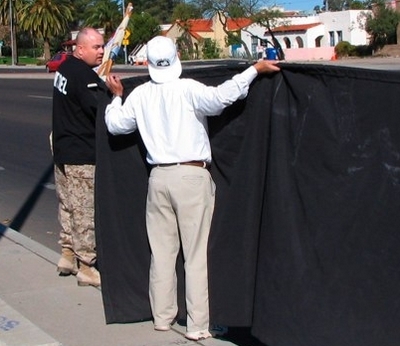 Soon two moonbats appeared early with a giant banner celebrating the two thousandth death of our military forces, attempting to "take the corner" in front of the strip mall. Recognizing one as a dedicated communist who had been there before but never accepted any articles or information from me, I grabbed my new sign, which said "Marxism Killed More Than War in the 20th Century." and stood in front of them. I noticed the other guy was wearing a worn Communist t-shirt, so I was on solid ground here. Flipping the sign around, I showed them the other side, which stated Marxist regimes killed one hundred forty eight million innocent people while war killed thirty five million military personnel in the 20th Century. "You Communists are the biggest killers of all!" I stated. "Why do you want to kill so much? How can you say you are against killing when those following your philosophy killed four times as many people as war? Killers!" I took a position farther down the block. As they were surrounded by too many Pro-Americans where they were, they left that corner and came over by me, followed again by more patriots. The Communist I didn't know immediately focused on one young lady to talk to, mocking her sign indicating fallen military heroes are now guarding Heaven, with photos of soldiers and Marines. "Why do you pick on the smallest, youngest girl in this group?" I asked. "I'm not picking on her!" he retorted, "I just didn't think Heaven needed machine guns and all that to guard it." "It's an allegory," I explained gently. "Would you like an article on Communism?" Suddenly the other Communist butted in. "Give me your information! I'll tear it apart!" This guy (who usually carried a UN flag) had always refused my printouts of various columns, but wanted me to see the movie "Good Night and Good Luck." I had told him I read the Ann Coulter review and I'd rather not see the movie. I had also offered him a printout but he never took it. Now he was quivering with rage; I must have gotten to him with my 20th Century death count sign. I quickly handed over printouts of "The killing machine that is Marxism" by Professor R.J. Rummel, "The Changed Baathist: Interview with Ali Ibrahim Al-Tikriti" by WorldThreats.com and "Are you now or have you ever been a second-rate filmmaker?" by Ann Coulter. He folded them up, promising to read them later and talk about them with me when we next met. The other Communist also took a few columns. 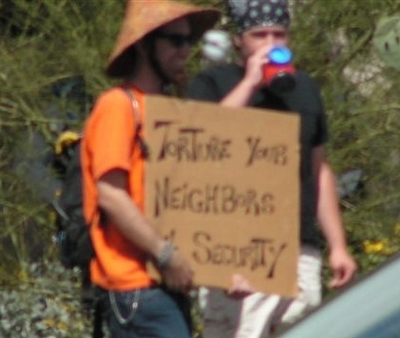 Soon rally leader Pat Sexton came to let us know the Tucson Police Department had brokered a deal with the moonbats where they would stay on their side of the street and we would stay on ours. Ours was the Military Recruiting Center side, of course! The two Communists took off immediately across the street. 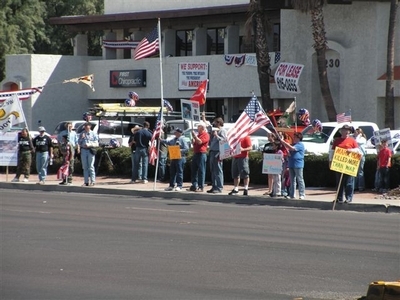 As time went on, more Pro-Americans gathered until we had almost a hundred. A few lefties showed up early, some wandering around our area and looking a little freaked out until they saw the moonbat signs and scurried across the street. Our side had gentlemen that helped the ladies cross, of course! Smiling Congressional candidate Randy Graf waved various Pro-Troop signs with gusto, however, when thanked for officially supporting the troops as a politician, he got serious. "Our men and women in the military are the ones who deserve thanks," he declared. Vietnam Veteran and State Representative candidate Gene Chewning also appeared with his wise smile inspiring everyone. Pastor Chewning, leader of a thriving church, is also a longtime veteran of Wednesday morning troop support. One wonders where the Pro-Troops politicians are in Washington DC on Friday nights. Perhaps they are visiting a fancy bistro or enjoying a play. I certainly haven't seen any reports of them at the entrance to Walter Reed Army Hospital holding a sign or flag to support the troops. Rallies are held there every Friday night and are rather famous. I can't believe they haven't heard of them. The Tucson Police Department Bicycle Squad began zooming about, indicating the march was getting near. They warned us that we might see offensive signs that would make us angry and politely requested we stay calm. However, the moonbats had just the usual coffins, signs falsely accusing troops of torture, and upside down American flags. The right side up ones were painted with peace signs. A socialist dance group with Aztec style costumes led the march with ominous drums beating time. The marchers seemed quite shocked to see so many supporting the troops and preventing their access to the strip mall as they lined up across the street. By now, we were over one hundred strong with more arriving and spreading out down the sidewalks. All recruiting signs in the strip mall were covered with banners and flags, preventing liberals from posing for propaganda pictures with the signs in the background. One moonbat on a bicycle that I recognized from previous protests rode up and inquired what was going on. "Pro-Americans on this side, Anti-Americans on that side," I told him. "What! They're not anti-American!" He seemed quite upset and tried to convince me of his point but I explained that I read their literature. He cycled over to a Pro-American shouting at the liberal side, "Where's your flags?" and asked to borrow his. 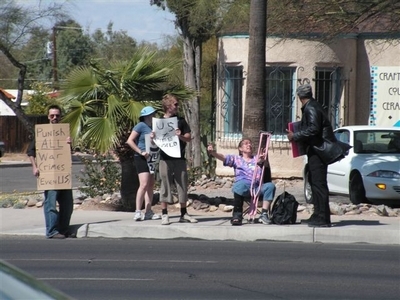 The man complied and he rode across the street to join the moonbats while clutching the American flag. It was the only right side up undesecrated one on their side that day. Later he returned the national symbol of the United States of America unharmed and unburned. Our side sang many songs such as God Bless America, America the Beautiful, Star Spangled Banner, Yankee Doodle Dandy, Amazing Grace and Kumbiya. I sang all the military theme songs. The other side yelled a lot but spent much time just staring slack jawed at our animated troop support. In our area we engaged in cheering, singing, waving flags and supporting our military. We also praised the TPD Bicycle Squad. "That's a first," one officer was heard to mutter after a cheer from a hundred throats. At least three local news stations conducted interviews; a statement from one of our people I saw later drove it all home. "We are preserving our freedom, which is something I hold so dear, because I didn't have it in the country that I was born in." Interviewee Nina Samuels is also a long time veteran of the Wednesday morning troop support rallies. The "anti-war" mob quickly deteriorated as they began leaving in droves while we were still gaining population. Perhaps they had to hurry and catch their chartered buses. It was estimated they had about two hundred people, but were getting mainly yells of derision from the cars while we were getting many honks of support. Every time a large group of lefties departed we sang "Na, na, na, na...Na, na, na, na...hey, hey, hey...goodbye!" waving with cheery goodbyes. Our numbers stayed strong until only a few holdout moonbats were left which we now far outnumbered. Some Air Force ladies not in uniform came and distributed drinks and snacks to the patriotic Americans. For some reason, they didn't go to the other side despite "anti-war" claims of troop support. "Fascists! Fascists!" desperately yelled one man over and over with a megaphone on the left-wing side, until someone else grabbed it. "We loooooooove you!" the second guy shouted happily. "Let's hang out and smoke a doobie!" The first guy grabbed the megaphone back. "Fascists! Fascists!" he continued. Earlier someone who had observed the park rally had commented to me that this was "the craziest bunch of people he had ever seen." I was starting to see what he meant. Late in the afternoon a self declared anti-war humanist (but against communism) came over to debate but was amazed at how much information we all knew about Iraq and the war. He wasn't able to get away with a single falsehood. A multiple tour Iraqi war veteran covered with IED wounds, now a teacher, challenged him often. "Have you read the Quran?" the 3rd Infantry Division Army veteran demanded as the arguing leftist tried to explain to him how the Iraqi people feel. "I have - in Arabic! Listen, Greenpeace is taking volunteers to help in Iraq. I'll give you the number. Why don't you go over there and see for yourself?" The would be debater quickly fled. 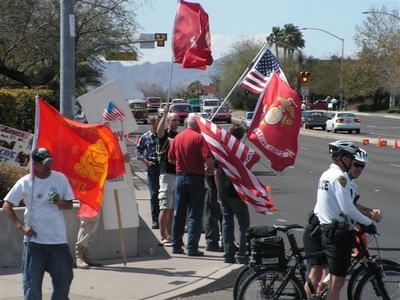 The rally was a total success as liberals were prevented from occupying and trashing the Military Recruiting Center. Also, many prayers and shouts of support were given for our wonderful military, their families and their mission of freedom that most Americans support wholeheartedly, skewed liberal media polls notwithstanding. Across the nation in many cities on this day, patriotic citizens stood fast against left wing mobs. Yes, they have free speech. So do we. So do you. How will you employ your liberty as our troops fight in faraway lands? I say use it to stand up for our military and America! Travel to the future and see tomorrow's column today! There are a few more interesting things that happened I will include for this expanded AAR version. 2. Speaking of hearing each other, at one point the "fascist" yelling megaphone guy started to get together the old chant "Drive out the Bush Regime, the world can't wait." Immediately I joined in with my megaphone, saying "Drive out the Bush Regime, SADDAM can't wait!" He soon stopped when he realized I was propagandizing his side. I didn't let it go right away though. I continued in an extremely mocking tone for about fifteen more chants. After that there was quite a silence from them. 3. I had a "Human Shield" banner which you can barely see the edge of in some of the pictures. Thanks for the idea, Danish Embassy freepers! 4. The wind was very high! The Human Shield banner lasted a long time but eventually ripped apart. 5. We ran completely out of extra signs and flags. 6. Many cited the Washington DC Chapter Walter Reed victory as their inspiration. 7. When they were almost gone the cops left, driving by to pick up the cones with door ajar. As they passed, I said in the megaphone "Your door is ajar, your door is ajar." Har de har har! 8. At one point when Channel 4 local news passed I said with the megaphone: "Hurray for the unbiased American Media!" to many cheers. The reporter looked a little miffed as if she suspected sarcasm. But later Fox News accepted the accolade routinely. 9. Operation signpost was an obvious success because someone had chalked moonbat sayings underneath the signs like "Killing is a sin" and "War is hatred." 10. When the police left and only a few were on that side some of ours went over there. I thought they would keep a distance but heated words were exchanged. Noticing one Pro-American was carrying a gun openly, a moonbat called the cops and one came back. But nothing happened. It's perfectly legal to carry a gun here in AZ as long as it's not concealed. If it is concealed you need an easily obtained permit. 11. Later, the black leather jacket guy called across "Are you Christians? Why do you have guns, then?" Nina called back in her South American accent: "I'm a Christian. I have a guuuuun. So whaaaaat?" The leather jacket guy was probably not a Christian himself since he had previously unleashed a loud and long string of obscenities at us which seemed to indicate a heart not in tune with the Lord. But who knows? 12. Later, this same guy was the last person to leave, along with a lady. They stuck it out for an extra hour or two although they had no signs and nobody passing could tell why they were there. When he went behind a nearby building for a few minutes and then came back around to the front he was greeted with derisive inquiries wondering if he felt better now. Eventually they left. declared Communist that his death count banner is not a good thing. The obligatory flag draped coffins make their appearance. Another false accusation while "supporting the troops." Some of the last holdouts in the Moonbat Zone including black leather jacket dude. High USA flag saturation index in the Military Recruiting Center. The stamina of the Pro-Americans was amazing. They stayed a long time. Many songs were sung on our side, I finally had a group that would sing with me! Some Marines and the Tucson Police Department Bicycle Squad. There's a signpost up ahead...your next stop...the Moonbat Zone! she decorated every car with patriotic sayings. She also loves to sing! Her friend was very dedicated as well. Well done. Freeping's fun, isn't it? Awesome freep. Thank you for standing up and for the report and pics. God bless you. Great AAR, Great Planning, Great FReep!! I'm also glad that you had so many FReepers show up. Great turn out. "a weekly Wednesday morning protest at the same location that has been reduced to about ten protesters or less,"
Don't these guys have jobs? "6. Many cited the Washington DC Chapter Walter Reed victory as their inspiration." With humble thoughts, it works both ways. FR supports each other. Your supportive words on the WR Threads really helped us, especially when the weather got cold. 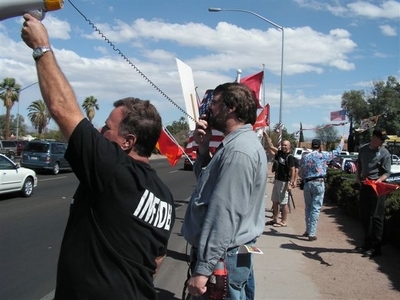 People at the rally had been discussing it and so, for the first time at that location, liberals were counter-protested by eight Pro-Americans. The newspaper completely ignored the eight counter protesters, however, I'm sure the word is getting around Moonbat Central. Hi Wayne. I loved your report and the pictures. Thank you so much for being willing to go out there against those nasty "peace lovers". I know first hand that they are anything but peaceful. Great job! God bless you! There were scattered protests on Monday all over. They had one at the Pentagon. Some FReepers and Protest Warriors were to be there. I've been noticing that the MSM lately ARE doing more positive stories on our troops and Iraq. Even ABC had something and 60 Minutes had something a week and a half ago. But they are still hammering Pres. Bush every second they get. At least the troops are starting to get a fair shake. Hopefully that will rub off on Bush, with people seeing that the troops respect Bush and hold no malice towards him. MAYBE out counter protests are succeeding. Excellent work by true patriots. My hat is off to you people. Good FReep. I was in Tuscon last week. Bad timing on my part I guess. Fantastic AAR, Wayne, as always! You describe everything so vividly, I swear I now have a tan from your Arizona sun! Listen, Greenpeace is taking volunteers to help in Iraq. I'll give you the number. Why don't you go over there and see for yourself?" The would-be debater quickly fled. Great job everyone, thanks from the bottom of my heart. Thanks for the report, pictures, links and activism. Outstanding! Along the same note. Today I was driving home from a store and saw a bunch of peaceniks with their signs along Wadsworth Boulevard here in Denver, Co. The signs read the usual canned slogans against Bush and the War, being carried by the freeze dried hippies from the 60's. well being a veteran and all I got pissed off, so I turned my Toby Keith CD up as it was on the song appropriately entitled "The Angry American". The tunes were playing loud and I gave them all the "You're No.1 Chickensh*ts" sign with my middle finger extended and arm as high as I could stick it out of my drivers side window. I know they saw me as one dude kept staring at me as I drove on past. I didn't care as it felt sooooooooooooooooooo good to do what I did. It was in the middle of traffic and I hope others saw it as well. Freedom of speech that I fought for and defended is a wonderful thing is it not?! Hey it certainly is. Good for you. But stay in your car, you sound like you might be tempted to use that Colt if provoked! Excellent stuff! I cracked up while reading. This is one small, but substantial, reason for being conservative and loving conservatives. Well done! Are there other AZ Freepers we should congratulate? Not this time, however there were at least 5 Protest Warriors, one came from Phoenix. Veteran groups, Republicans, and military mom organizations were the core of the group. I didn't publish a notice on the main Freep board because I didn't want to tip off the moonbats. I did make a mention on the AZ state Free Republic board. Right now a Southern Arizona Freeper can FReep every Wednesday morning from about 8:30 am to 10:30 am at the military recruiting center - moonbats are there every time. There is something going on every Saturday morning, too but please freepmail me for that information. Freedom of speech that I fought for and defended is a wonderful thing is it not?! Yes, it is and I appreciate your Navy service - my Dad was on the USS Boxer in Korea. What's with the Navy always beating the Army in football these days! Can't you guys give us a break?! Last night in church as our pastor preached he referenced Ephesians 4:29: Do not let any unwholesome talk come out of your mouths, but only what is helpful for building others up according to their needs, that it may benefit those who listen." It really made me think about FReeping and trying to maintain the high road. I don't judge you for flipping them off; their malicious lies about our troops is enough to cause extreme anger in anyone. And I have probably gone over the line myself. However as Christians we can look back and think about our actions, pray over them and let the Holy Spirit be our guide as to what we do in the future. We must "Love your enemies and pray for those who persecute us" but it doesn't mean we have to condone their abhorrent actions or not stand up for our country against evil. Striking a balance is hard but something I always strive for. The final answer is a personal decision that we each must make. I pray that we all make the right ones.